n the land of oddities, chalk up the 1994 SWC race as a two-headed goat with both male and female parts. Never before had a team with more than two losses won the SWC crown. Never before had five teams shared the trophy. All that changed in 1994 when due to a curious series of events 62% of the conference won the conference title. In Part one we looked at the fateful hammer of the NCAA, which crushed favorite Texas A&M's chances of another league title. In Part two we looked at the odd group of remnants left to challenge for the crown. We ran down all the bizarre results in Part III. In Part IV, we try to make sense of it all. After the dust settled, five teams tied for the Southwest Conference title in 1994, each finishing 4-3. By-laws dictated the institution that hadn't been to the Cotton Bowl in the longest period would get to go celebrate New Years Day in Dallas. The Cotton Bowl never hosted Texas Tech, so the Red Raiders received the nod. If you're into symmetry, the result meant that every member of the SWC went to the Cotton Bowl at least once. Tech became cannon fodder for USC in the worst loss in Cotton Bowl History. By the way, in November, when the Cotton Bowl announced that USC would be Tech's opponent, Red Raider coach Spike Dykes was unavailable for comment. He was deer hunting. Texas received a bid to the Sun Bowl where they beat North Carolina and Mack Brown. TCU qualified for the Independence Bowl where they lost to Virginia. Baylor went to the Alamo Bowl and lost to Washington State. Undefeated A&M, hobbled by the NCAA, stayed home. The next season the league gave control of the Cotton Bowl to the Bowl Championship Series, and as a result, Oregon met Colorado in the lowest attended game since 1977. Congratulations. As far as we can tell, Texas, TCU, Rice, Texas Tech, and even Texas A&M had rings made to commemorate the '94 season. They were novelties before anyone ever wore them. The AP named Max Knake the first team All-SWC quarterback after throwing for 2,624 along with 24 touchdowns and seven interceptions. His TCU teammate Andre Davis was the SWC Offensive Player of the Year thanks to his 1,494 rushing yards. Zach Thomas earned AP Defensive Player of the Year, and his brother Bart made the first team in the secondary. Spike Dykes was the Coach of the Year for bringing Texas Tech its much sought after Cotton Bowl glory. On July 2, 1995, the league, formed in 1914, was officially a lame duck with just one season left to play. Texas won the title, beating A&M in College Station on the last night of the regular season. They printed up "Champions Forever" t-shirts before the crowd even cleared out of Kyle Field. Three teams finished in the AP top 25 (Texas, A&M, and Texas Tech), five had winning records. If the league required a constant gardener, the jungle reclaimed most of it before 1994, that season just exposed the rot. As early as 1990 Texas and Texas A&M were actively pursuing invites from other leagues. Everyone else was trying to hold on for dear life. In the end, ESPN made it clear that any merger wouldn't include all of the SWC, the Longhorns and Aggies would write their tickets, Texas Tech was the next logical choice, and the higher-ups decided on Baylor over Houston for the last slot. We now know that a full merger of the two leagues was put down, at least initially, by Texas. At a meeting in Dallas with all sixteen member institutions, fifteen voted to merge, the one abstention was Texas who said they would have to go back and think about some things, and might prefer the PAC 10. Texas' hesitance scared the hell out of everyone else and they rolled over, giving Texas basically whatever the Horns wanted. The hard lesson for the rest of the league was that stagnation equals death. Houston moved into the then state of the art Astrodome in 1965. By 1994 Cougar games seemed ill-suited for the cavernous eighth wonder of the world. SMU played in either Ownby Stadium, a glorified high school field, and the Cotton Bowl across town. In spite of the newly installed grass, Amon Carter was showing its age. And of course, Rice was Rice, still playing in a giant monument to their success of the mid-century. Then there was the NCAA, that constant reminder that the league was crooked and cutthroat. The death penalty destroyed SMU for almost a quarter century. Houston played the most exciting football in the country for several years in the late 80s and early 90s, but NCAA sanctions kept those best Cougar teams from a SWC crown or national title contention. 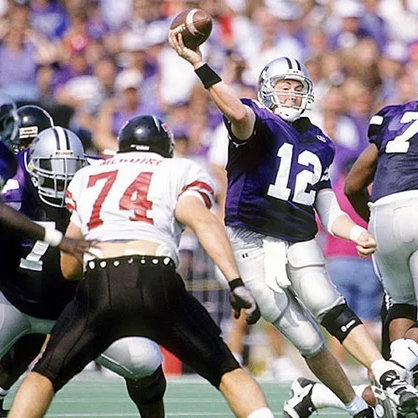 TCU uncovered a pay for play scheme after an eight-win 1984 season and never clawed back. All these hiccups, stumbles, and institutional decay led to the fall of the league and on a lesser scale a season of mediocrity in 1994. But hey, almost everyone got a trophy. Posted on July 11, 2018 by The Roundup and filed under Southwest Round-Up and tagged Everyone Gets a Trophy Texas Tech Spike Dykes Texas Longhorns Mack Brown TCU Texas A&M Max Knake Andre Davis Bart Thomas Zach Thomas SMU Houston Cougars Rice Owls Amon G. Carter Ownby Stadium Astrodome.